Mint is a self hosted website statistics package created by Shaun Inman. For me, it has replaced both Google Analytics and FeedBurner for my websites statistics. Although Mint costs $30 per site it is still (in my opinion) the best option out there for anyone who is serious about their website. Mint is self hosted, which means you have to download some files and upload them to your own server to make them work. There are some server requirements to getting Mint working but Mint’s website offers an easy to use Server Compatibility Suite that you can upload to your server before purchasing Mint to make sure that it is compatible with your server. Installing Mint is incredibly easy, and if you’ve ever installed WordPress you’ll feel right at home. Just input some database information into a configuration file, upload the Mint directory to your server, visit yourdomain.com/mint, and follow the browser based instructions. A default install of Mint already does practically everything you need it to, it will track page view, unique visitors, search keywords, referrers, views on individual pages along with the ability to backup or restore your Mint database. But, similar to WordPress, Mint has a plugin architecture called Pepper that allows you to add new functionality. 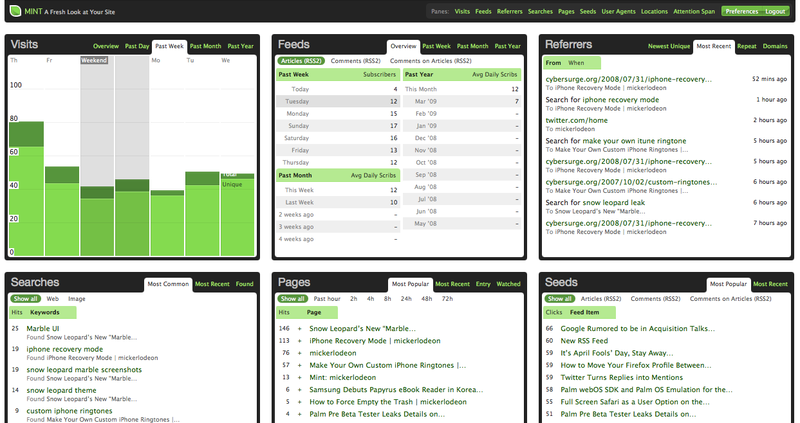 Bird Feeder Pepper – Highlights subscription trends across multiple Feeds and clicks on individual feed items. User Agent 007 Pepper – Shows what browser, OS, and what resolution your visitors have. 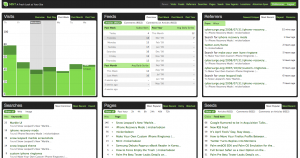 Attention Span Pepper – Displays bounce rates and pages per visit. Locations Pepper – Displays the geographical location (based on IP address) of your visitors. iPhone Pepper – Gives you an iPhone-friendly version of your Mint stats when visiting from an iPhone or iPod touch. The extension of Mint doesn’t end at Peppers, you can also install new “styles” for Mint so you can view Mint in any color scheme you want. Mint has a very clean design that makes viewing your stats very comfortable. All of your different stats are organized into Panes that are can reorder from the preferences page. Although the default preferences for Mint makes it difficult to minimize white space just by reorder panes, a little bit of tweaking will get you an even cleaner look to your stats with very little white space. I had to turn on “fix pane height and use scroll bars” otherwise I would end up with one row of panes much longer than the others, it didn’t look very good, and since I’m a little bit of a design nut I had to fix that. However, there are some downsides to Mint. The font size on Mint pages is a little small, I could easily use my browser to increase the font size but that would increase the font size for the entire domain, and since Mint is on the same domain as this site it would also increase the font size for me here. There aren’t any quality graphing options available to visualize traffic throughout the history of your site (I kind of prefer line graphs). The Fresh View Pepper comes closest but it always displays a graph including the current day, which means the end of the graph is always significantly lower than the rest of it (depending on the time of day you are viewing it of course), and there isn’t any way of ignoring the current day when viewing the graph. There isn’t anyway to view statistics history. You can view page views and uniques by day, but only within the past 6 days, you can view them by week, but only within the past month, etc.. I’m sure I could see day by day stats if I looked into the database but I shouldn’t have to do that. I should be able to (just like Google Analytics) select a period of time and see statistics for it. Mint is clearly the best option out there for those who want good statistics, clean design, and more control over where your stats are stored (i.e. not on a large company’s server, like Google’s). There is also a great community around Mint. Mint’s website has a fantastic forum filled with people ready and willing to talk about Mint and help you with problems that might arise while using it. The forums even has a section dedicated to Pepper ideas, so if you have an idea for a Pepper but don’t have the skills required to build it you can offer it up to someone in the community to build. Since most of the problems I have with Mint could easily be fixed by Peppers I will probably help contribute by inputing my ideas into the Pepper ideas section of the forums. By the way, did I mention that the domain for Mint is “haveamint.com?” Just based on the name alone, how could you not buy it? Update 4/9/09: If you were wondering how I got Bird Feeder to track my RSS feed stats, I didn’t actually edit any of WordPress’s core files, I just installed the Bird Feeder for WordPress plugin.